There is no doubt pressure cookers save you time and money. 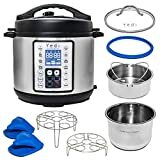 They allow meals to be cooked 70% faster than conventional cooking and when it comes to preparing healthy meals, this gadget is efficient and energy saving. It is no wonder they are growing in popularity. But where to start? There are so many choices out there. We have put together this shopping guide to help you navigate through the choices, making deciding much easier. Assisting you in finding the very best product to suite all your cooking needs. There are two main types of pressure cookers, electric and stove-top cookers. These pressure cookers can be broken into two material categories, aluminium and stainless steel. To help you choose the right one for you, here is a breakdown explaining each. 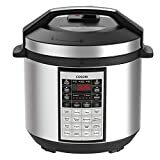 Electric Pressure Cookers: These cookers have their own built-in heating mechanism. 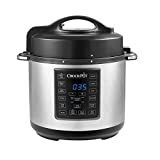 They have convenient timers that mean you can pre-set when it switches on, you can cook dishes from start to finishing without having to keep an eye on it and it regulates the pressure and heat automatically. These cookers are great for a busy household, as it has features where it automatically switches off when the meal is done but keeps it warm until serving, saving a lot of time. 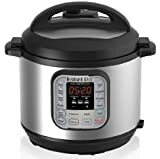 Stove Top Pressure Cookers: Stove top pressure cookers, get their heat from the stove element, like a pot. That means you have more options to manually adjust heat settings and have more cooking flexibility. 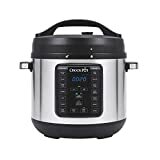 Browning those onions or chicken pieces before setting them to cook is easy with this cooker and its size variety and range means you can get one that fits any family size. Aluminium Cookers: These cookers are lightweight and easily transportable, making them great for camping as well. Aluminium cookers are good conductors of heat and cook more evenly, plus they are very economical so great on the wallet! Stainless Steel Cookers: Stainless steel cookers are non porous and are not easily damaged over time. These cookers don’t retain odors from cooking and their parts are easier to clean. Size: Being able to cook enough for your whole family is very important. Couples are happy with their 5 litre cooker, while a mother of six who loves to freeze leftover soups loves her 10 liter. Buying the right size means you will have one cooker for all yours needs. Versatility: People are happiest when no recipe is out of bounds for their cooker. That means their cooker is big enough and versatile enough to make anything from soup to stews. Easy to clean: Pressure cookers are all about convenience. This goes for cleaning too. Something easy to clean means cooking will be fast and so will the clean-up, and will generally get much better reviews! Quality: Pressure cookers should be made to last and a good quality cooker keeps people happy years after their purchase. Reviewers who have opted for higher quality cookers rate their cookers much higher than those that haven't. You get two types of pressure valves, a jiggle-top and a spring-valve. Spring-valves provide more accuracy with cooking. Cookers smaller than 5 litres, cook meals for two and are easy to store. Cookers that are 5 – 7 litres in size are great for families with 3 – 5 members. Cookers that are 7.5 – 10 litres are the perfect cookers for large families or if you often cook for friends as these cookers cook for 6 people or more. 10 litre cookers are fabulous if you want to cook for your family and make extra to freeze for later. These cookers can cook for 15 people or more and therefore cooking lunch for extended family and friends is a breeze. Most cooking recipes suggest 15 psi setting, so select a cooker that can go to this level. Alternatively add 10% cooking time for 12-13 psi or 20% more time for an 8-9 psi cooker, to adapt your cooker to any recipe. A lot of recipes require accessories such as a steamer basket or a cooking rack, so finding a cooker that includes these will provide good value for money. Combination stove top pressure cookers that are stainless steel but include an aluminium base, provide the best of both worlds. Even heating and durability. All American: All American Cooker is owned and operated by Red Hill General Store, Inc. 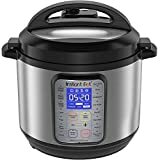 They have been in business and an authorized dealer for Wisconsin Aluminium Factory/All American since 1998 and a household name in pressure cookers. Presto: Presto was founded in 1905 in Eau Claire, Wisconsin. 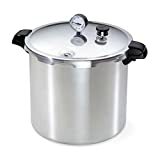 Making a host of kitchenware, it is a top quality pressure cooker brand. 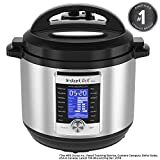 Instant Pot: Instant Pot is designed by Canadians specifically for North American consumers. 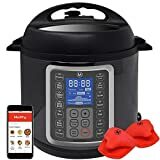 It is made in China by the No.1 electric pressure cooker manufacturer who has produced and sold over 30 million units for household use worldwide. Fagor America: Fagor America, Inc. is a wholly owned subsidiary of Fagor Electrodomesticos. Since opening their offices in 1992, the Fagor brand name has become synonymous with high-quality stainless steel pressure cookers.